Playing at games, especially games of chance, for money. Among the ancient Israelites no mention is made of games of chance, and no provision was made against them until the period of the Mishnah. With the introduction of foreign customs and amusements in the latter period of the Second Temple, playing with dice ("ḳubya," κνβεία), the popular game of antiquity, was adopted by the Jews. The Rabbis were bitterly opposed to these imported fashions, and looked upon them with intense aversion (see Midr. Teh. to Ps. xxvi. 10, which speaks of "those that play at dice, who calculate with their left hand, and press with their right, and rob and wrong one another"). The Mishnah disqualified the gambler from testifying before a court of justice (Sanh. 24b). Since robbery was defined in Jewish law as the act of violently appropriating something belonging to another against his will (B. Ḳ. 79b), the Rabbis could not make gambling a capital crime. They did, however, forbid gambling of any kind, and considered it a form of robbery; but since it was not actual robbery, money lost in games of chance could not be collected through the courts of justice (Giṭ. 61b; Maimonides, "Yad," Gezelah, vi. 7-11, 16; Shulḥan 'Aruk, Ḥoshen Mishpaṭ, 370). The games mentioned in the Mishnah in connection with the laws of witnesses are playing at dice and betting on pigeons. The reason for denouncing men who engaged in either of these games was, according to some, that they were guilty of robbery; according to others, that they wasted their time in idleness and were not interested in the welfare of humanity (see Betting). The Gemara included all games of chance under these two headings, such as draughts ( , ψῆφος), races, etc. (Sanh. 24b, 25b). The term "ḳubya," used in this connection to signify dice (Shab. 149b), was later applied by the Rabbis indiscriminately to any kind of gambling game. Dice, lotteries, betting, cards, and other games were commonly indulged in by the Jews of medieval Europe, and many decrees ("taxḳḳanot") were passed in the various communities against them. So wide-spread were these games that even scholars and prominent leaders of the synagogue were seized with an uncontrollable passion for them. Leo da Modena (an eminent scholar who lived in Venice at the close of the sixteenth century) was known as an inveterate card-player, so that the rabbis of Venice, fearing the pernicious results of such an example, issued a decree (1628) excommunicating any member of the congregation who should play cards within a period of six years therefrom. Such communal enactments had been very frequent in Italy, a typical instance being preserved in a decree of the community of Forli dated 1416 (S. Halberstamm in "Grätz Jubelschrift" [Hebr. section], p. 57). These enactments were stringent, and equally so was the punishment for their violation; yet they were not always heeded by the people. The eve of Christmas ("Nittal Nacht"), when the students of the Law refrained from study, was considered most favorable for card-playing. The restrictions were also disregarded on new moons and the week-days of Passover and of the Feast of Tabernacles, at weddings, on Purim, and especially on Ḥanukkah, when even pious and scholarly men indulged in card-playing. In spite of the strenuous objections of the Rabbis, the custom still prevails in many cities of eastern Europe of playing cards on Ḥanukkah soon after the candles are lighted ("Ḥawwot Ya'ir," p. 126). 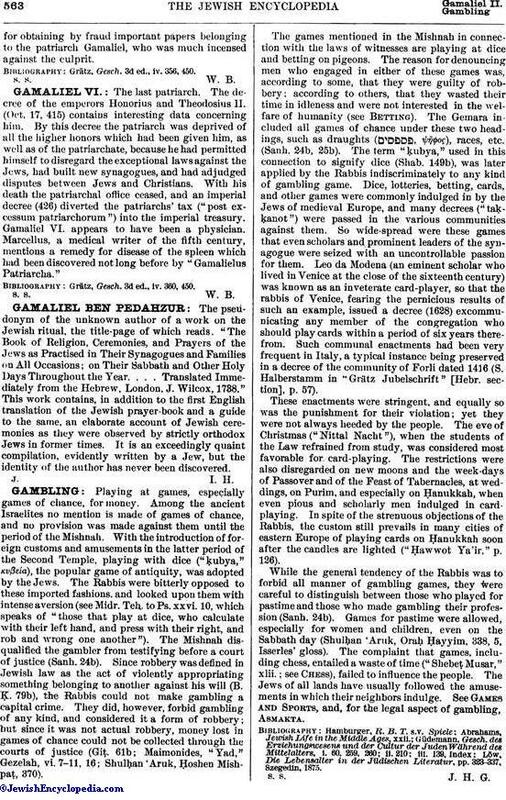 While the general tendency of the Rabbis was to forbid all manner of gambling games, they were careful to distinguish between those who played for pastime and those who made gambling their profession (Sanh. 24b). Games for pastime were allowed, especially for women and children, even on the Sabbath day (Shulḥan 'Aruk, Oraḥ Ḥayyim, 338, 5, Isserles' gloss). The complaint that games, including chess, entailed a waste of time ("Shebeṭ Musar," xlii. ; see Chess), failed to influence the people. The Jews of all lands have usually followed the amusements in which their neighbors indulge. See Games and Sports, and, for the legal aspect of gambling, Asmakta. Löw, Die Lebensalter in der Jüdischen Literatur, pp. 323-337, Szegedin, 1875.